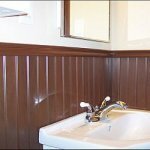 With so many different BeadBoard wainscoting options to choose from, it is hard to know which Beadboard trims or kits are for you. Let's look at some of the features that each product offers and how that fits into your project. Want to add an aire of refinement and history to your home? All it takes is one weekend. Here at Elite Trimworks we make it quick and easy to add traditional elegance to houses everywhere. Choose from any of our packaged, pre-cut kits that contain everything you need or individual Beadboard Planks or custom made Sheets. Our beadboard wainscoting kits let you turn back the clock in the best possible sense of the phrase. BeadBoard is a traditional architectural feature that includes delicate, vertical grooves -- "beads" -- milled into wood. Beadboard can be used as stand-alone wall paneling or surrounded by stiles and rails as part of a wainscoting installation. Either way, beads are key. They conceal joints and any slight mismatch between neighbouring panels. They also provide just enough visual interest to attract the eye. Closely spaced beading looks best in shorter installations, wider bead spacing for tall ones. The Elite Bayside is our most formal beadboard wainscot kit. It's available in paint grade, red oak, hard maple or cherry suitable for staining. The paint grade, MDF system uses 8-inch-wide interlocking planks divided visually by a bead running down the center. The horizontal bottom and top rails are also notched to fit over the ends of the beadboard planks, making it easy to achieve tight joints and professional results. One design feature that gives the Bayside its appeal is the generous bottom rail. It's a full 7 inches tall. That's wide enough to let it stand out proudly, even the largest rooms. Like all our wainscot kits, each Bayside covers 8 running feet of wall. Just don't be fooled by the formal good looks. The Bayside is easy to install, too -- ideal for any do-it-yourselfer. The Elite Shiplap Wide Plank Kit is our latest beadboard wainscoting kit that has the Modern Farmhouse look that is very popular with designers today. The kit uses the same Cap and Rails as the Bayside kit. The only difference is that instead of Beaded planks, we use 5 1/2 inch-wide interlocking ship lapped, planks divided visually by a “V” groove. The V Groove looks more like boards or hardwood flooring due to the bevel that runs along the side edges of the planks. They come with everything you need in 38, 58, 96 or 108 inch high kits. 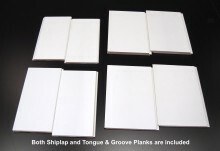 Vinyl Beadboard Kits - They are made with planks like our Bayside beadboard kits except they are made from vinyl PVC. Vinyl Kits have many advantages like being waterproof, scratch resistant and they do not required painting. They can be painted or you can order them in different colours. You will have no difficulty choosing between the beaded or V-Groove look here as the Vinyl planks are reversible, beaded on one side and V-Grooved on the other. These kits are very popular for bathrooms where moisture issues may arise. Elite Beaded Panel Wainscot uses 24-inch x 24-inch panels of beadboard instead of planks. The design also uses vertical stiles to divide these beadboard panels at regular intervals, based on a theme popular in country farm houses built around the turn of the twentieth century. Panel widths are completely customizable, too. Cut them so they're all the same size. This delivers symmetry throughout the installation regardless of wall length. We're standing by, ready to help you choose the right product, determine how much material you really need, and coordinate safe delivery of your order. 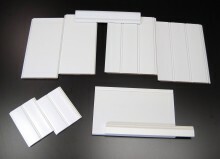 We always stock Elite beadboard kits, so delivery is fast, you'll get your order a few days later. Just think what your home could look like this time next week.